Zoe is about 2 years old. We think she is Chihuahua/pug with maybe something else mixed in. She came from a home with a mom who loved her dearly but was no longer able to take care of her. 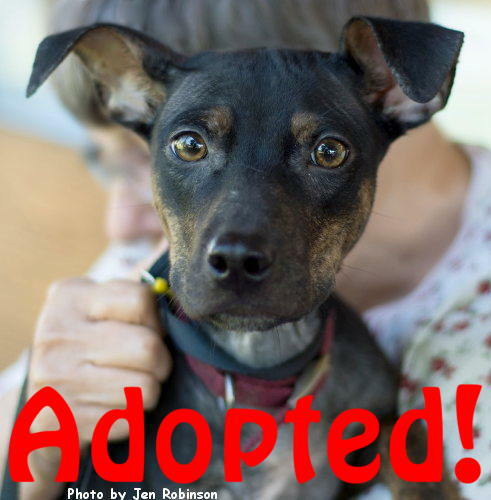 Up until she came to her foster home, her life was spent inside, usually on her mom's lap. She weighs about 15 pounds and is full of energy. She enjoys playing with her toys, of which she has many. She still has some puppy in her, but when it comes to nap time she loves to curl up in a lap for a cuddle. 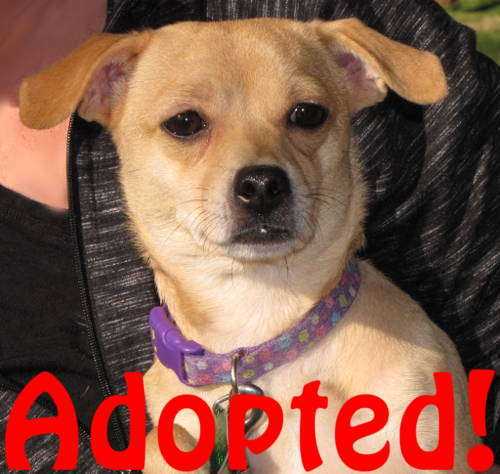 She has an older foster sister, a Jack Russell/Chihuahua, and she gets along great with her. They share toys, water and sometimes food without too much friction. She is still getting used to being outside and sometimes is scared when the wind blows. She jumps on occasion when a leaf moves. She is doing extremely well with house-training. She will let you know when she needs to go, which is usually right after she eats. She is also trained to go on a pee pad when there is no one to let her out. Zoe is used to being in a kennel during the day and that is where she prefers to sleep and take her toys to keep them away from her sister. She is still learning to walk on a leash and ride in a car. At present we are sticking with putting her in a kennel for trips. She is sweet and cuddly and fun to watch at play. Sweet, sweet Poppy. Found as a stray in Anderson County, TN, this special three-year- old, 45-pound Dalmatian, Lab, who knows what? mix, is waiting patiently for her forever family. She is shy at first but warms up after she feels comfortable with her people. Poppy is quiet (her foster mother has never heard her bark), walks beautifully on a leash, is totally housetrained and ignores the foster family cats. Because Poppy is still a little shy, she would probably be more comfortable in a home with children who are at least school aged. She would love to go to a home with another dog to play with, but she also does fine on her own. This is a very easy-care dog who, because of her excellent house manners, obviously had a home before she became a stray. Please won't you open your heart to Poppy and giver her the love she so richly deserves? 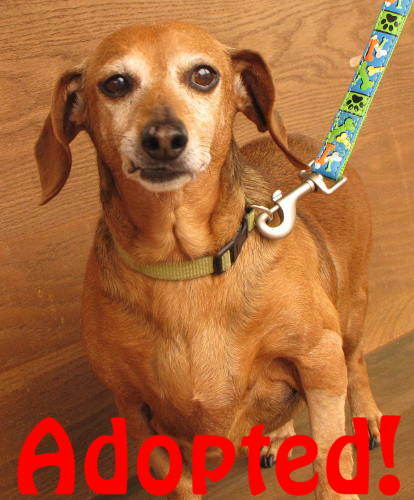 Gracie is an 11-year-old, spayed Dachshund. She weighs 19 pounds. SARG rescued her from a local veterinary office where her owner intended to have her put to sleep. She was wetting in the house a lot and was being treated for UTI. However, it turned out, once our vets examined her, that her bladder was filled with bladder stones. Since her surgery to remove the stones, she has not had one accident in her foster home, and she lets her foster mom know when she needs to go out. Gracie also had a dental, and a few teeth were removed. She is on a special diet for the bladder stones, and she will eat moist and dry food. She gets along very well with both of the 70-plus-pound dogs in her foster home and is sweet, loving, wags her tail all the time, and likes to give kisses.She also loves walks and car rides. Gracie will lie down with you as long as you'd like, but she does have a doggie bed and sleeps in it all night long without a peep. 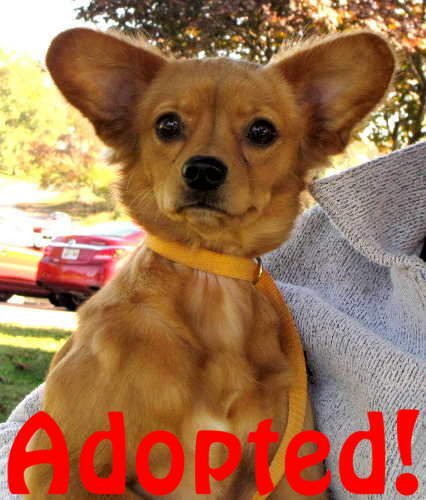 Tracey is a 4-year-old Chihuahua mix. She was an owner turn-in at the shelter and seemed friendly with another dog at the shelter. She came in with Bear, with whom she had been together in their home for about a year. She hasn't been tested with cats yet. 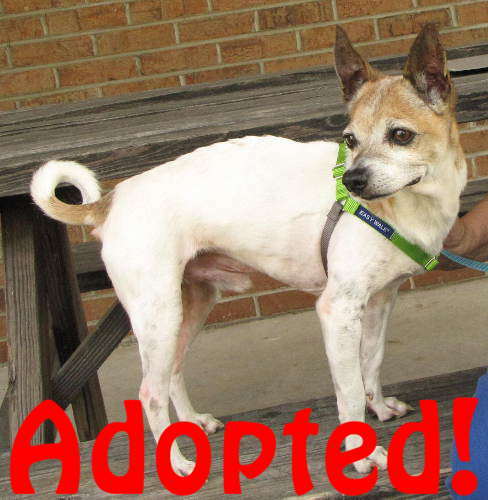 Zep is a 7-to-10-year-old rat-terrier mix who came to SARG after being found as a stray in Anderson County. 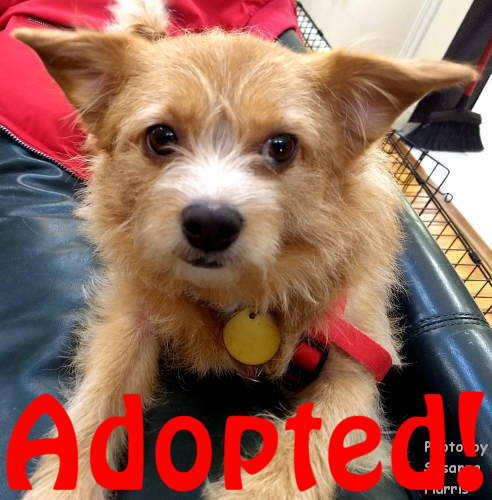 He is a funny, quirky, chatty little guy who is what we call in rescue an "easy keeper." He is almost the perfect dog and no trouble at all. He is housetrained and doesn't bother anything at all in the house. He likes to go for walks but does not need to go all that far nor all that fast. He's more interested in checking out the scene. He rides well in the car and is always ready to go. He does like to "talk" to you while he is in the backseat. We think he is asking if we can go by Dairy Queen for a pup cup. (Yes, Dairy Queen will give out a "pup cup" of vanilla ice cream.) He will let you know when someone new comes into the house, but he settles down quickly and will soon be up on his haunches being cute. He does that, a lot. We are not quite sure why he does it, but he does it quite a bit along with some grunts, like he is trying to tell you something. The foster home thinks he is one very special guy who is very deserving of a great home. He does not ask for much: some cushy dog beds, good food, some walks and a little bit of attention. He gets along fine with other dogs and would probably be OK with older kids. At adoption events he has completely ignored cats. Nayla is an 80-pound boxer mix full of youthful energy and sweetness. Her foster dad has house-trained and leash-trained her. She loves going on walks, playing fetch, and visiting the dog park, as well as playing with her foster siblings (both big and small) She is very people-oriented and wants to be by your side or, better yet, in your lap whenever possible. She is a quick learner and wants to please her humans. Her size and young energy will require a person or family who can provide space and plenty of daily exercise time. In return she will be your fun, loving, and loyal forever friend. 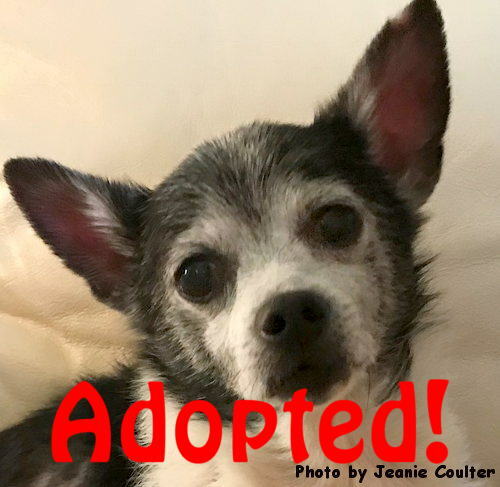 Elvis is a sweet and loving Chihuahua mix who is approximately 13 years old. He has a few health issues for which he is taking some medications; but despite his issues, he is a spry and happy little boy. He loves to run and play, but he is a cuddle bug too. 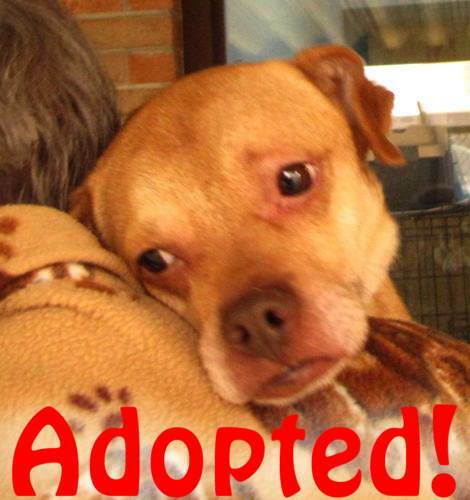 Elvis lives in a a foster home with several other dogs and he gets along with all of them. He appears to be housetrained, but he does have an occasional accident. Elvis is looking for a loving forever home and a human companion with a big heart. Hi, I'm Dixie! I'm a one-year-or-so-old mix of some sort. Everywhere I go there is plenty of discussion on what I might be, mountain feist/cur/doberman/miniature pinscher mix of some variety. My foster mom says, though, that I am 20 pounds of legs and cuteness. I have not quite figured out what all to do with these long legs and sometimes I'm a little uncoordinated and hit the wall when playing inside. 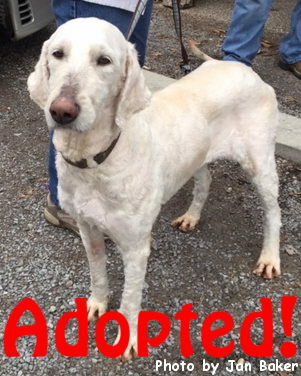 I was found wandering in Anderson County, so I don't have much to say about my life before SARG but I sure am glad to be in a foster home! I get fed regularly, I learned a doggie door in seconds, and I have foster siblings to play with. Life is pretty good now. My foster mom walks me pretty regularly and I keep hearing her tell people I'm a 'dream' on a leash. I think that must be a good thing as I usually get pets after that. I LOVE to go for walks. Foster mom says I would be a great walking, jogging and/or hiking buddy. I'm always ready to go, even at 6 in the morning! I like to ride in the car and will jump in, sit down in the dog bed and not make a peep til we get "there," wherever "there" may be. I really enjoy playing with other dogs and I like to run, so a fenced yard is the best bet for me. I am housetrained, but SARG really recommends I go somewhere with a doggie door so I can go outside when needed, or have someone home with me so they can let me out. I like to go outside a lot. I'm still a bit of a pup, so my attention span is sometimes that of, well, a pup. I can be a little timid with strangers and new dogs, but it doesn't take long for me to warm up and then I'll be your best friend!! Did I mention I like to play and take walks? I need plenty of exercise to relieve some of my puppy energy, but then I like to take naps. My foster mom says I'm highly food-motivated and easily trained. All I know is, I like food, and occasionally I have to do stuff to get treats. That's OK, it seems to make my foster mom happy. Please contact SARG if you think I might be your new best friend. This little guy is Snowflake. 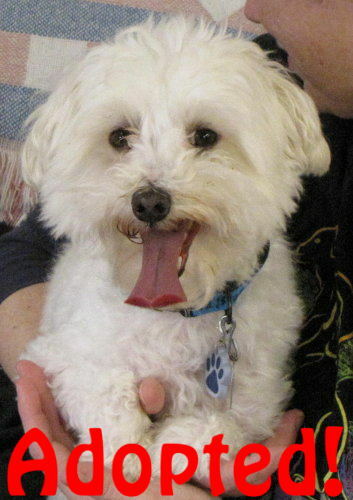 He's a registered Maltese, about 9 years old -- not so old for a small dog, as they tend to live longer than very large ones. 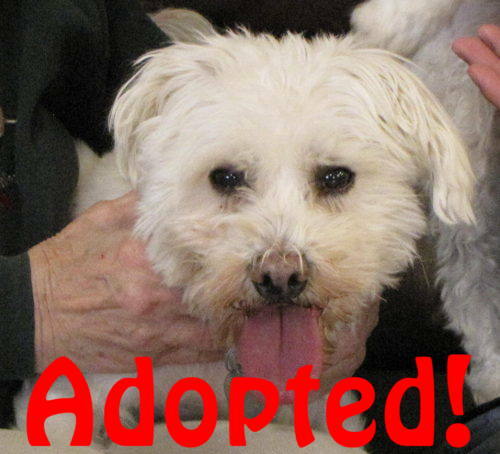 He was surrendered at the shelter by an elderly owner who could no longer take care of him. He's a friendly and active little guy who will be a great companion. 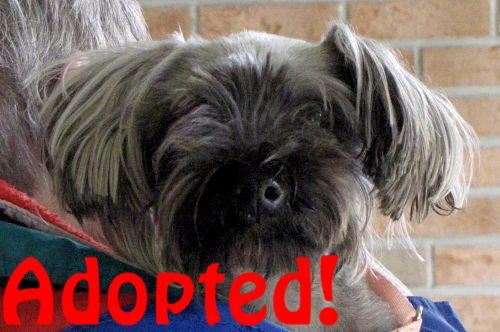 Tank is a little Yorkshire terrier male whose owner had to give him up because of her own serious illness. He is about 3½ years old and weighs approximately 10 pounds. He will be a very handsome little guy when his coat grows back out. 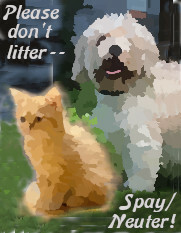 Diego is an 11-year-old Havanese male, and Gulliver is a 4-year-old male Malti-poo. They were turned over to SARG by their owner, who is very ill and unable to care for them. We believe they would be much happier if they stay together, but we're still evaluating the degree to which they are dependent on each other. 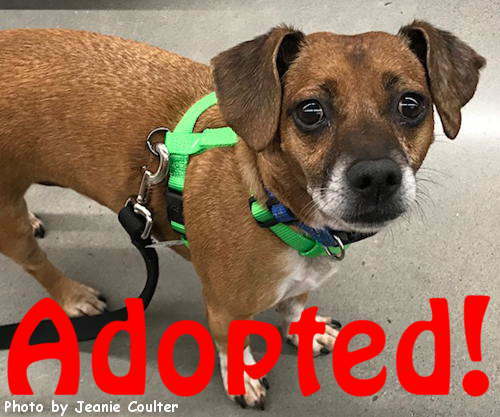 The video linked below shows them in the lobby of the boarding kennel when they were brought out and got to run around together and check out the toys that came with them from their home. Video of Diego and Gulliver. 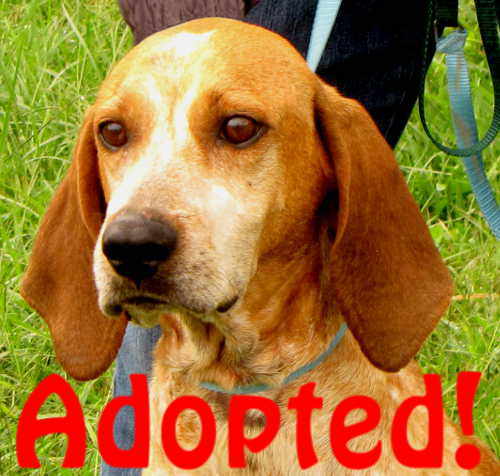 Lucy is a 5-year-old, spayed red-tick coonhound who weighs 50-60 pounds. 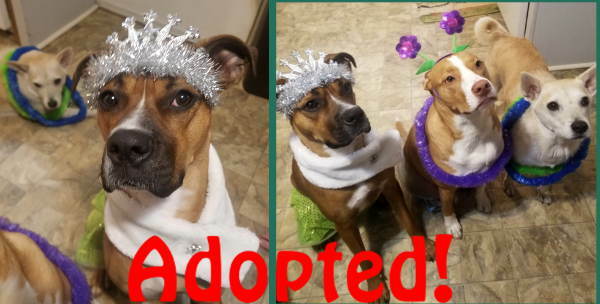 Through no fault of Lucy's, the family who adopted her from SARG in 2016 has had to ask us to re-home her. Lucy is a sweet, loving soul. She is currently living with foster parents, a small child and another very large dog. We don't know how she would be with cats. Lucy, being the hound that she is, will get on a scent and want to track it. For that reason, we will be asking for a home with a fenced yard. Please consider giving Lucy the permanent home she so deserves. An application will start the process with SARG to determine if she could fit into your home and lifestyle. We haven't a clue what mix of DNA Brady has in his family history ... very likely a little bit of everything. He weighs about 20-25 pounds or so as of now, but he is somewhat underweight. Brady seemed to like other animals at the shelter ... he wanted to go and meet the other dogs in the lobby at the time. He seems to have an aversion to going through doorways -- he could have beeen punished for doing that. He is friendly and loving but at the same time very submissive when approaching someone. He will definitely need someone with patience who is willing to give him time and TLC to train him and help him build his confidence. And that process is already beginning in his new foster home. 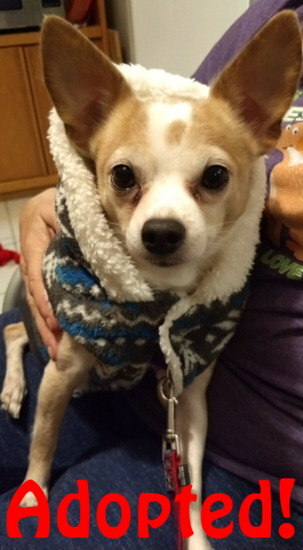 Chipper is a 6-year-old male Chihuahua mix. If you are looking for a real lap dog, Chipper is your pup. So many superlatives come to mind: the sweetest, the gentlest, the most affectionate, the most companionable, etc. He hasn't had much training, but he is very responsive to training as he wants to please so badly. Chipper loves to be with you and hates to be alone. He does well in a household where someone is home most of the time, and he gets along with small to medium-sized dogs. He is playful with other dogs and would probably do very well in a two-dog/multi-dog household. 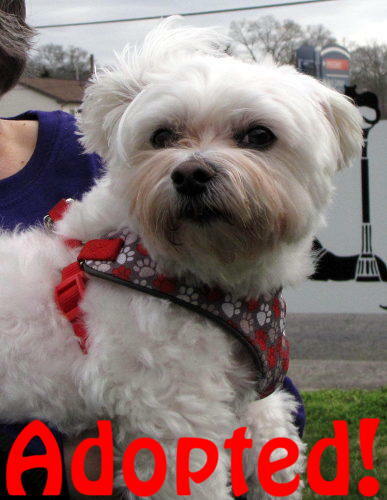 He enjoys walks, being taken around with you in the car and in a front carrier, and he walks well on a leash. In the evenings, he is an ideal TV dog, happy to snuggle under a blanket with you. And at night, he burrows under the covers and curls up against you. Barkley is a super-sweet, 5-year-old beagle mix, who weighs 16.6 pounds. Barkley is housetrained. He gets along well with other dogs and appears to get along with cats. He loves to play with his toys, although some of them don't live very long. Barkley's favorite game is tug-of-war. When he is not playing, Barkley loves to snuggle up next to his human to read or watch television. Barkley has some food allergies and is on a special diet. He will need to be kept on a limited ingredient food to prevent ear infections and skin issues from recurring. Barkley is looking for a special home that he can call his own, and he promises to be a loyal and loving companion. 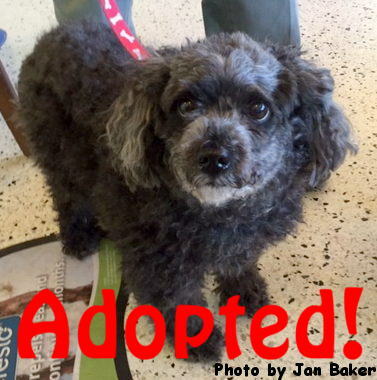 Bear is a 9-year-old male poodle. He was an owner turn-in at the shelter and seemed friendly with another dog at the shelter. He came in with Tracey, with whom he had been together in their home for about a year. We haven't tested him with cats yet. Belle is about 5-6 years old and weighs 59 pounds. Our initial guess is that she is a golden-doodle (golden/poodle mix). Her short hair is the result of being shaved. There are some "before" pictures in her gallery. She has a really sweet personality and appears easy to leash walk. She loves everyone she meets; she hasn't yet been tested with other dogs or cats, but we plan to do that soon. Cammie is 4-5 years old and weighs about 53 pounds. 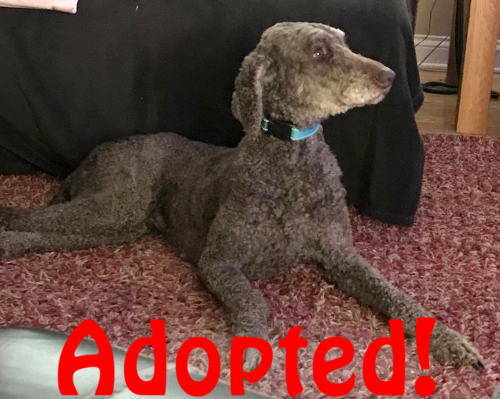 She appears to be a poodle mix, although the photo doesn't show it, since she had to be shaved. There are some "before" pictures in her gallery. She is good on the leash and sweet and friendly to everyone she meets, but is yet to be tried in close quarters with other dogs or cats. 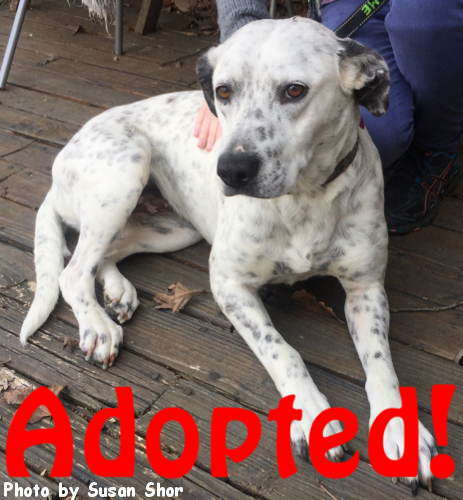 Daisy is a sweet, 50-pound, four-year-old catahoula hound, cattle dog, Dalmatian, and whatever mix. She is, like Mary Poppins, practically perfect in every way. She might not be able to fly with an umbrella, but she is calm, quiet, gentle on a leash and has great house manners. She is a quick learner and learned the commands, "come" and "sit" in one day. She almost has "stay" down also. Daisy was an owner-turn-in whose owner couldn't care for all of her six dogs when her husband died, so Daisy is used to being in a house with other dogs, cats and children. She loves being around people and everyone loves being around her. She doesn't chew, counter-surf, or shed. Best of all, she is totally housetrained. Did I mention that she is also beautiful and has the most soulful eyes, ever? Daisy is what her foster mom calls "an easy dog." 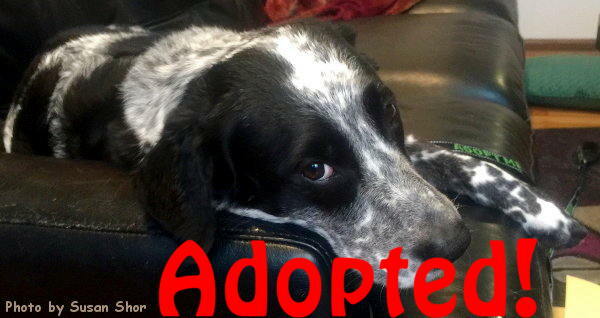 Whoever adopts this lovely dog will be gaining a very special new member of the family. 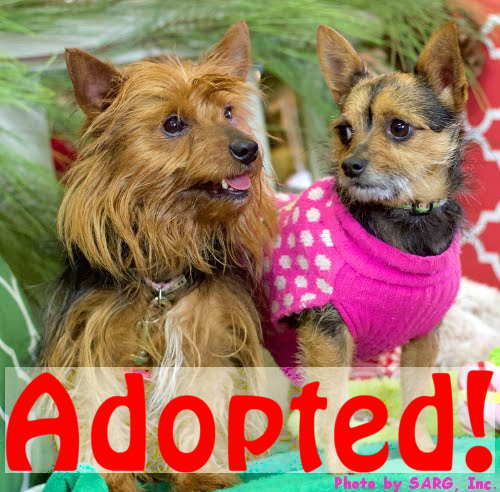 Rachael and Ryder are Yorkie mixes who were rescued from a house where they had been abandoned together for three weeks with an open bag of food to sustain them. They are very much bonded with each other and need to find a home together. Rachael is 4½ years old and weighs 14.1 pounds; Ryder is 2½ and weighs 10.4 pounds. Wanda is a small Chihuahua-mix female who was found wandering down the road by herself with a collar that was much too tight for her. She had no tags, and no one looked for her at the shelter. We currently do not have a foster home for this little girl, so if you could give her a temporary home until the forever one comes along, please do let us know. She is staying at the vet's office for now and is learning to walk on a leash. She loves to snuggle, and she truly does not like being in the cage at the vet's office. ***"Other Adoptables" (when listed) are NOT in the SARG program, but they still need love and a forever home. Please contact the owners directly by clicking on the link. Please do not contact SARG. SARG offers no guarantee in any way related to any non-SARG animal -- the rescues, shelters, or owners involved provide their own descriptions, terms, and guarantees.